I know what you’re thinking: “haven’t I seen these before?” Well, yes and no. 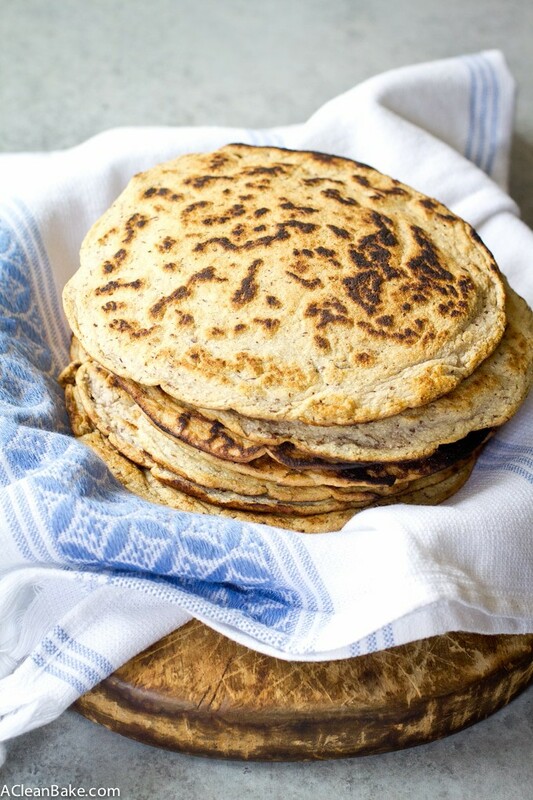 It’s true; these flatbreads do look like the grain free tortillas I posted here a while back, and they should, because that’s where I adapted the recipe from. But don’t be fooled. I wouldn’t use these flatbreads for a taco and a gyro sandwich – or whatever you put in your flatbreads – would be way too much for a tortilla to handle. It’s clear that we’ve all needed this recipe for a lot longer than I realized. Several weeks back, I posted a picture of my husband’s dinner on Instagram (we’re trying to meal plan more and eat out less, so I am posting pictures to keep myself accountable!) that included a piece of flatbread that, unfortunately, wasn’t gluten or grain free. I was a tease. So I decided to make it up to you by figuring out how to make equally thick, equally pliable, equally satisfying-to-sink-your-teeth-into grain free flatbread. 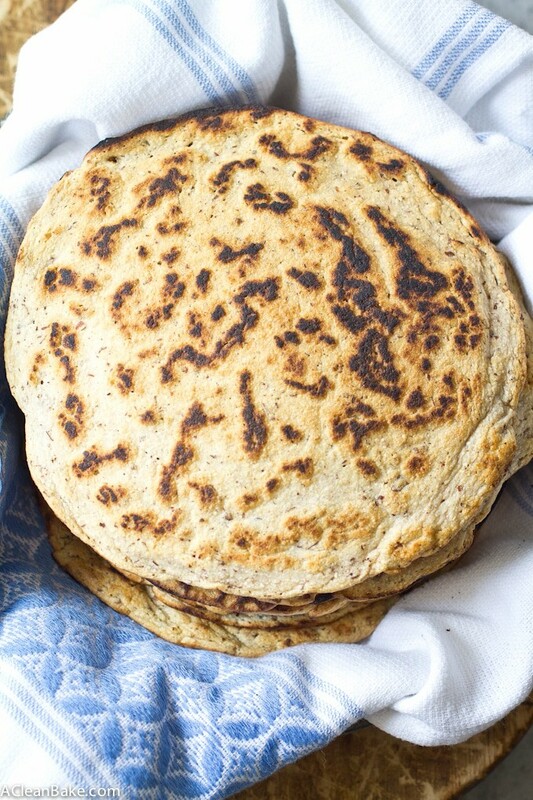 These flatbreads can go from pita to naan in 1.5 seconds flat. And I’m sure there are plenty more ways to use these that I haven’t even though of yet. What will you use them for? This grain free flatbread is such an easy and versatile recipe that is an amazing basis for sandwiches, wraps and ethnic food! In a large mixing bowl, whisk together the dry ingredients (flours, baking soda and salt). Set aside. In a small bowl, whisk the egg, then whisk in the milk. Pour the wet ingredients into the dry and stir to combine and eliminate any clumps. Stir just enough, but try not to overmix. You don't want air bubbles in your bread! Preheat a heavy-bottom 6" skillet (e.g. cast iron) over medium heat. Add just enough oil to cover the bottom of the pan (I recommend a nonstick spray if you have one - the less grease you use, the better, so use just enough to prevent sticking). Pour 6 Tablespoons of batter into the pan and quickly and gently shake/tilt the pan to spread the batter into a thin, even layer across the bottom of the pan. It's ok if the batter looks too thin; the flatbreads will rise slightly during cooking. The trick to success is to keep the pan at the right moderate temperate and let the flatbreads cook slowly so that they cook through without burning. If you think the pan is too hot, simply turn off the flame and let it cool for a few minutes before cooking the remaining batter. You can double this recipe, but you may need to add about 2 Tablespoons of milk about halfway through the cooking process if it thickens up too much. Ideally, instead of doubling, simply make two batches. Yes Nora! 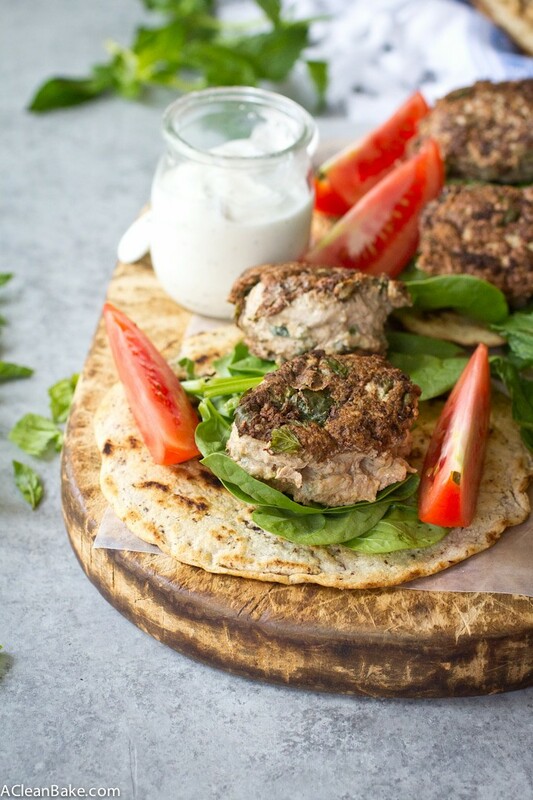 I need this flatbread in my life – and can only imagine how delicious it is wrapped around this meatballs 🙂 thanks for sharing! It is totally the best!! I thought this was supposed to be dairy free but it calls for milk. Yes, and you can use any milk you prefer: almond, cashew, rice, soy, etc. I hope you enjoy the recipe! And of course I have a bag of arrowroot in my kitchen I’d to use. So what do you think — arrowroot would work here? I just don’t know how my digestive tract would handle tapioca starch yet. Yes, that should be a fine sub! Let me know how it goes! 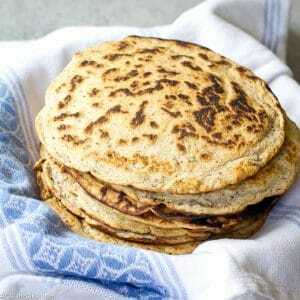 What ia the net carbs per flatbread? Hi Rachel! Unfortunately I don’t have that info, but you can put the ingredients into another calorie tracker (I like My Fitness Pal) that will give you a more comprehensive nutrition reading, and calculate the net carbs that way. Sorry! What kind of flour could you substitute for the almond? I’m allergic. Unfortunately, there is no easy sub for almond flour. Nut flours are finicky like that. Sorry! 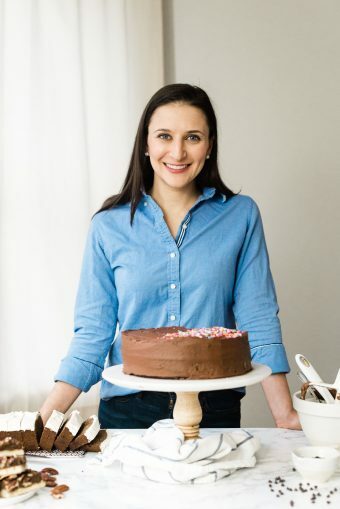 i’ve read in a few different blogs that cassava flour is a pretty close alternative for almond flour. Unfortunately, that is completely wrong. Almond flour is a high-fat (moisture) flour, while cassava flour is very starchy (Absorbent). I would not recommend replacing one with the other. These look excellent! Do you think they would wok with an egg replacer instead of the egg? I don’t tolerate eggs. Thanks! I can’t say with certainty (I’ve never tested it), but if you have an egg replacer you like and have had good luck with, it’s worth a try! Will you let me know how it goes? I made this for the first time today! They are awesome – worked first time and I made awesome fajita and received celeriac with goats cheese and kefer. Just fantastic. I made these to go with Borani Chogondar for my Cookbook Club. I love them! They are easy to make, the directions are spot on and they are so tasty! AND they are an awesome substitute for sandwich bread. Thank you! So glad to hear it, Ginny! Thank you for letting me know!